Abby the Librarian: Book Review: Outbreak! Happy Nonfiction Monday! Check out Picture Book of the Day for the roundup! Some diseases have changed the course of history. Did you know that the Black Plague helped break down the peasant-crushing feudal system of Europe? That smallpox paved the way for the European colonization of the Americas? That yellow fever might have helped end slavery? 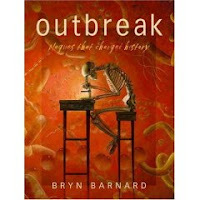 Bryn Barnard has examined six pandemic-causing diseases and how they affected history. He talks about the Black Plague, smallpox, yellow fever, cholera, tuberculosis, and influenza. He maps the spread of the diseases over continents and/or the world and talks about how each disease was perceived, how it was treated at the time, discoveries connected with the disease, and how all of these things affected the people of the time. I found it it be utterly fascinating and a great book for anyone interested in medical science or history. This book has been criticized for its political slant and it's true that Barnard writes in a fairly candid manner and definitely lets his opinion in. I did notice Barnard's political jibes, but they didn't bother me. Although a pretty extensive list of sources is included, I wouldn't consider this title to be a reference work but rather an appealing recreational nonfiction read. My only real problem with this book is its format. It's been published as a fairly large picture book, 48 pages long. The large pages are mostly covered with text with few breaks. For each of the diseases there are a couple of lovely paintings depicting some aspect of the disease. I think this book would have worked better as a smaller book. I think that would make it more appealing to the middle schoolers to whom the text is aimed and that would make the text-heavy pages smaller and more manageable. Although I would have preferred a smaller volume, that didn't deter me from picking it up and devouring it. It might take some booktalking to bring it to their attention, but definitely consider this one for those science-minded kids and history buffs looking for a great read.